Customers can transfer money between banks in different cities, states or even countries by wire transfers. The information needed for a wire transfer includes the receiving bank’s routing number and the receiving party’s name, address, and account number. Important documents such as life insurance policies, special family photos, heirloom jewelry, and other valuable items are all items you hate to lose, or worse have stolen. We have a variety of safe deposit boxes we rent in different sizes and price ranges. This offers you the piece of mind knowing that your valuables are in a safe and secure place. Come in and visit with us concerning which box size and price is right for you! For your convenience we have a Night Deposit Drop Box located at the main bank. For business customers we have large bags for your convenience! Just ask one of the tellers if you would like more information. If you request this option, we will automatically transfer funds from your savings account to your checking account in order to cover an overdraft in your checking account before it occurs. A transfer fee of $3.00 per day will be charged to your checking account each day a transfer occurs. This is just a small price to pay should you forget to transfer the funds yourself, contact a CSB&T Customer Service Representative if you would like to sign up for this service. Please remember that an insufficient funds fee of $12.50 per item up to $9.99 and $25 per item over $10 will be charged that results in an overdraft. 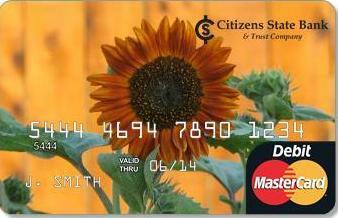 Overdraft privilege is not a line of credit and the privilege may be withdrawn by Citizens State Bank & Trust Co. at any time. Your next deposit will be used to repay the amount of the overdraft and the overdraft fee. You must bring your account current within 30 days of the overdraft occurrence or the Overdraft Privilege will be removed from your account. Please remember that this notice does not constitute a written agreement of an obligation or a prearranged agreement for Citizens State Bank & Trust Co. to pay your overdraft, and we may withdraw this privilege at any time. We can assist you in signing up for Direct Deposit for your Social Security, Pension, State, Payroll, or any other type of check received! We will be glad to help you fill out the necessary paper work to put your mind at ease with Direct Deposits! When your out of town or the weather is bad, your check will be safely in your account with no worry! We will be glad to assist you in the redemption of U. S. Savings Bonds. Visit www.treasurydirect.gov to purchase a new savings bond. You will need the bond holders name, social security number, mailing address, and if you wish to put a second name on the bond, you will need their name. You may want to find out what your Savings Bond is worth today. We can help you with that as well! The ATM/Debit Card is more than just an ATM card! With this card you can directly access a checking account throughout the country by using an ATM or make purchases through a merchant that accepts Debit MasterCard®. It is a fast and easy way to pay for your purchases instead of writing a check. They can also be used to make purchases from a merchant with an authorized signature instead of a PIN, when the merchant is a Debit MasterCard® point-of-sale-location. No annual fee and no item fee if used at our ATM. If you need to report your debit card lost or stolen, please call Shazam at 1-800-383-8000. If you need to contact Shazam Falcon Fraud for transactions in question call 1-866-508-2693. We offer a Visa® Credit Card for your convenience. Stop in and pick up and application today! Citizens State Bank & Trust Co. in partnership with The National Drovers Hall of Fame is proud that a portion of each card’s revenue goes directly to support The National Drovers Hall of Fame in our community. We offer Cashier's Checks and Money Orders for your purchase. Cashier's Checks and Money Orders are a convenient way to pay for purchases or expenses. A small fee may be charged for these items. Order your checks online from Harland Clarke, our preferred provider!